Amazing 200 degree sea views, absolute beachfront, 10 paces and you are on one of Northland's favourite white sandy safe swimming beaches. Great for one or two families to share. Two double bedrooms (1 x king, 1 x queen beds) a bunkroom (2 bunk sets sleeping 4) and a small bedroom with 2 single beds. Sleeps 10 with 8 kayaks and a stand up paddle board for your use. Large open living area, 42” TV, stereo with Spotify and Netflix. Only 1 Neighbour. On-site parking for several cars and boat. •	Oven, Cook top, Microwave, 2 drawer dishwasher, 2 x Fridge Freezers, Toaster, Jug, Mixers etc. •	Large amount of crockery, utensils, baking and serving dishes, cups, glasses, wine glasses, etc. •	Nespresso coffee machine with 1 packed of 10 coffee pods supplied – bring your favourite flavours. Quality tea pot and coffee plunger. •	Amazing 200 degree beach and ocean views. •	Life jackets covering a variety of sizes from a toddler through children to adults. You have full access to the house, kayak shed with 8 kayaks and a stand up paddleboard, and laundry in the garage. We live in Auckland but our caretaker lives just 300 metres from the house in case anything arises during your stay. Jan and I have three adult sons and were both fortunate to have parents who loved holidaying at the beach. We always had a two-week summer holiday at a beach somewhere, whether it be in a family tent on one of my Dad’s mates' sections, later in a caravan, or in my grandparents bach at Lang's Beach or my other grandparents home at Paihia. When I was about 15 my parents bought a bach at Oakura Bay and we spent many happy summers holidaying and boating there. 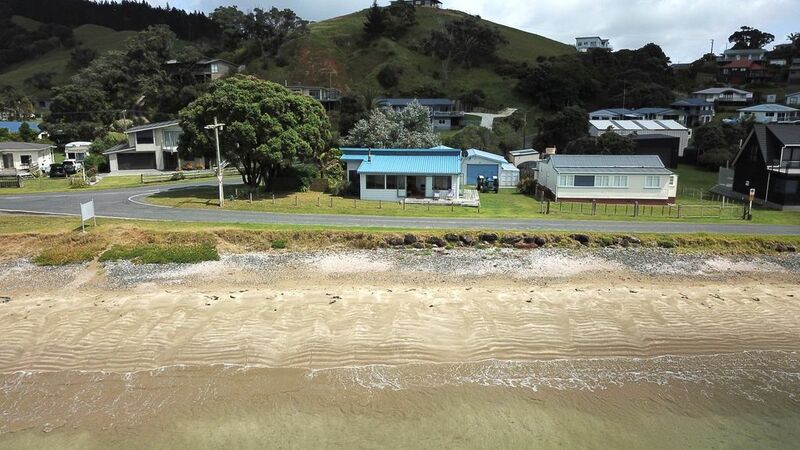 When my parents relocated from Northland to a farm in the King Country and sold their Oakura bach we carried on holidaying here in the camping ground at Pirutahi Bay, just over the hill from Oakura. Eventually we bought our own beach house at Oakura and have holidayed there regularly since 1999. It is right on the beach and gets all day sun being one of the last baches to loose the sun in the evening. We did a major rennovation and modernisation after purchasing it to give an indoor - outdoor flow and to make it suitable for accommodating two families together at the same time. 8 x Kayaks, 1 x stand up paddle board, unlimited wifi, 42" flatscreen TV, good quality stereo for your use plus 4 bedrooms to accommodate two families together. Large bathroom with large shower, wheel chair access to toilet plus a separate toilet room. The property is nestled right on the beach front. It takes only 10 paces from the deck to the sandy beach. Wood fire with firewood supplied. Nespresso coffee machine with initial supply of 10 pods. Bring your own preferred Nespresso compatible pods. Coffee plunger - bring your own ground coffee beans. Full kitchen with lots of cooking utensils, pots and pans, plates and cutlery catering easily for 12+ people. Large deck area on 3 sides of house. Like all beach properties in the region all of our water supply comes from our tanks which collect rain water from the roof. We're currently in drought conditions (almost no rain for 2.5 months) and the limited water supply needs to be conserved. During these conditions we put a water restricter on the shower outlet to reduce the flow from the full 60psi pressure to prevent earnest teenagers from wasting lots of the limited water. We've done so since 2004 and this is the first time anyone's mentioned it as an issue for them. Our second trip to Oakura Bay. What a gorgeous spot! Great beachside batch with everything you could need for a fun holiday by the sea. What a stunning place! Beautiful location right on the beachfront. The house has everything you could possibly need. We really appreciated having access to the kayaks and paddleboard. Our week was an absolute treat, and we hope to be able to return in the future. Delightful comfy house and amazing location just a few steps from the beach. Delightful comfy house and amazing location just a few steps from the beach. Just loved sitting out on the deck in the mornings chatting to the friendly locals and the fish & chips in the local store are to die for! Would happily rent again in the future. Great kitchen, loads of plates, cutlery, sharp knives, chopping boards and all the essential's needed. Great location!! Great Bach! Had an awesome time. Great location!! Great Bach! Had an awesome time. Would definitely return.